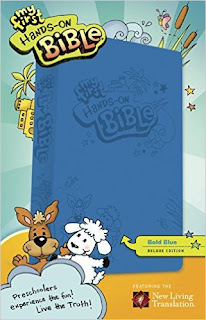 My First Hands-On Bible is an excellent beginners Bible for children ages 3-6. My 3 year old adores her My First Hands-On Bible because it has a leather like cover and looks like her older sisters Bible. She also enjoys that it's filled with beautiful pictures to keep her engaged while I read the lessons to her. I love that this Bible contains 85 key stories from the Bible and that it includes actual scripture. I also love that My First Hands-On Bible feels like a real Bible and really helps preschoolers feel just like they have their own Bible. It comes in blue or pink and is built to last due to it's durable leather like cover. I highly recommend My First Hands-On Bible for anyone with a preschooler in the house! You can find My First Hands-On Bible on Amazon and at other bookstores.